Using a randomized layout, TIm Balon created a striking installation using Granada Tile's Santander tile design. The tile design is highly versatile, allowing for nearly infinite layouts and color combinations. Tile photo courtesy Tim Balon. Last week, while working on Granada Tile‘s monthly round-up cement tile installation ideas, we were particularly struck by Micaela Clark’s really fabulous take on our Santander cement tile design. 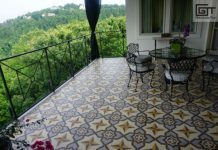 It reminded us of just how flexible the cement tile design can be. 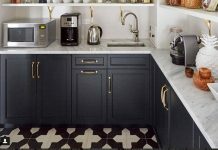 With a few quick tweaks to its palette and to its orientation in your concrete tile installation, it can take on all sorts of fascinating looks. You can start simple, going for striking and minimal black and white. It’s always a great choice. But, what about tweaking that just a tad? 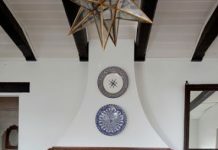 Instead of installing the concrete tiles in a continuous series of diagonal stripes, you can take a page from designer Tim Balon’s book and install them in a more varied pattern as he did in the cement tile backsplash of San Francisco Victorian. If that’s too much variation, you can still mix up Santander with some really neat results. For instance, you can create a fun, mod hexagonal design by choosing a palette with three colors. Here, we opted for coral, black and white, but you could do this with anything your heart desires. Just keep all the concrete tiles going the same direction, and you’ve got a design that elevates the look with a more attenuated riff on the shape. If you’re looking to spice up a kitchen with some smashing wall tiles, for example, this would be one way to do it. 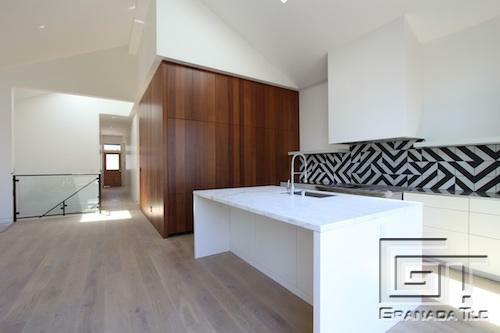 With Santander, a few changes to the palette and layout yield a snappy, attenuated hexagonal cement tile installation. Tile photo, Granada Tile. If you’re looking for something big and bold to install over a expansive space, Santander is a great choice for that too. You can create a large-scale tile installation in a great diamond pattern. In this case, we chose a range of blue hues for a harmonious effect. It offsets the substantiality of the design. But, if you really want to create some impact, adding some contrast would be a pretty smashing choice. Orienting Santander into a diamond pattern creates a dynamic, large-scale tile installation that will make a stunning impression. Tile photo, Granada Tile. With only these tile installation ideas, we’ve only scratched the surface of what you can do with Santander. Try it out for yourself using our interactive Echo Collection catalogue and our layout tool to come up with your own looks. Check back here too—we can’t stop playing with this amazing concrete tile design.